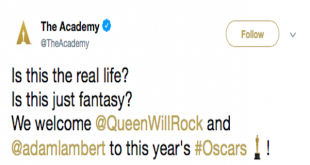 “Bohemian Rhapsody” wins big at the Golden Globes, snatching Best Picture – Drama and Best Actor for Rami Malek. Director Bryan Singer has been fired from the Queen biopic Bohemian Rhapsody by Twentieth Century Fox. Director of Queen’s upcoming biopic Bohemian Rhapsody couldn’t help but share this new picture.